In Toon Boom Studio, there are several different views and toolbars. In this section, you will learn about the main ones that are used frequently. All others are described in context in other chapters. The Camera view is the main view you use to create your artwork and animate it. In the Camera view, you find the camera frame in which you position elements to be part of your final movie. Anything outside the camera frame does not appear in your final export. 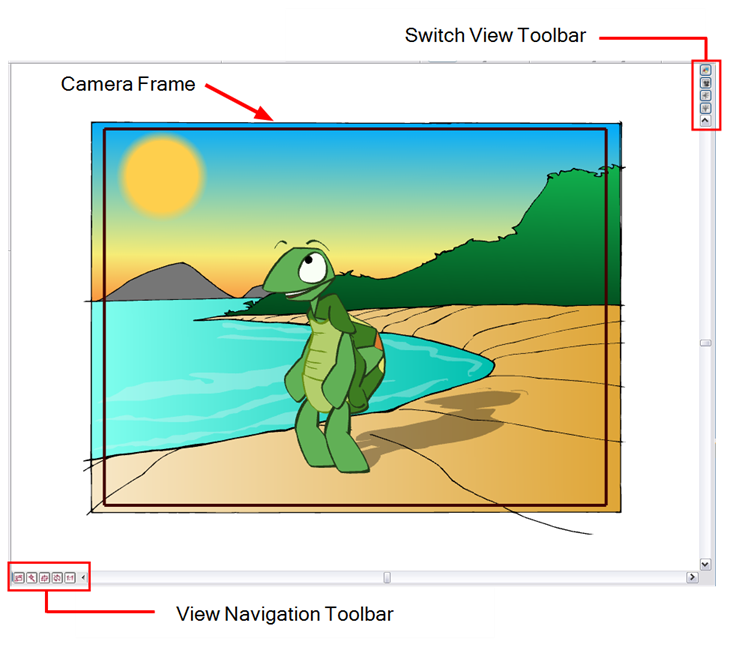 In the View Navigation Toolbar, you will find five buttons allowing you to zoom, pan and rotate the Camera view. This toolbar is useful when switching between these views to save room in your workspace. You can also have these views separately by selecting them in the Window menu. The Timeline view is the main view used to create layers, set your timing and create simple effects. The Timeline View toolbar is composed of eight different buttons allowing you to add, enable and disable layers as well as switching between the different scenes of a same project. Show/Hide All Switches between showing and hiding all layers in the Timeline view. Solo Mode Lets you see only the currently selected layer, as well as the layer that was selected when you enabled the Solo Mode. This lets you use it as a reference without having to disable all the other layers. Deletes the selected layers in the timeline. Note: If you delete a layer with other layers connected to it, all the layers will be deleted at the same time. Also, if you only have one layer in the timeline, you will not be able to delete it. The Toon Boom Studio Timeline view must always have at least one drawing layer in it. Adds a drawing layer in the Timeline view. You can then double-click the new drawing layer to rename it. Adds a peg layer in the Timeline view and connects it to any selected layer. You can then double-click the new peg layer to rename it. Scene Menu Cycles through the different scenes in your project. Timeline View Menu Displays a menu of commands related only to the Timeline view. The Drawing Tools toolbar contains all of the different tools you need to draw and design your artwork. Some extra commands are located in the top Tools menu. 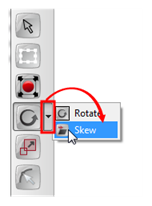 Some of the buttons in the toolbar have a black drop-down arrow, this lets you open a menu with extra drawing tools. Refer to the Drawing and Design chapter to learn more about the drawing tools. The Animation Tools toolbar contains all of the different tools you need to position and animate your layers. Some of the buttons in the toolbar have a black drop-down arrow, this lets you open a menu with extra Animation tools. Refer to the Setting the Scene chapter to learn more about the Animation tools. You can play back animation and sound by using the Interactive Playback toolbar or the Play menu (in top menu). • Frame Rate: Lets you choose the playback speed of your animation. By default, the option is set to use the same playback speed you set in your Animation Properties when you created the project. In the drop-down menu, you can change it to 1, 2, 12, 24 or 30 frame per second. • Force Frame Rate: Forces Toon Boom Studio to play the right playback speed. If a scene is too heavy to be played back in real time, Toon Boom Studio drops images rather than playing back all images at a slower pace. • Playback Range: Specifies the range of frames to be played back. By default, the option is set to Automatic Fit allowing you to play the full scene length. If you set the option to Free, black markers appear in the Timeline view. You can drag these markers to the first and last frames you want to be played back. You can also select Play > Playback Range > Change the Playback Start Frame to type the number of the first frame of the playback range. You can also select Play > Playback Range > Change the Playback End Frame to type the number of the last frame of the playback range. • Preview Movie: Exports a QuickTime movie of the entire animation project including all its scenes. You can press [Ctrl] + [Shift] + [Enter] (Windows) or [⌘] + [Shift] + [Enter] (Mac OS X). • Preview Scene: Exports a QuickTime movie of your current scene, ignoring the other scenes in the project. You can press [Ctrl] + [Enter] (Windows) or [⌘] + [Enter] (Mac OS X). • Preview Exposure Sheet: Exports a QuickTime movie of the drawings in the exposure sheet of the current scene only. This type of render ignores all the motion path and scene planning done in the Camera view. You can press [Ctrl] + [Alt] + [Enter] (Windows) or [⌘] + [Alt] + [Enter] (Mac OS X). • Preview Exposure Sheet Selection: Exports a QuickTime movie of the selected drawings in the exposure sheet of the current scene only. This type of render ignores all the motion path and scene setup done in the Camera view. You can press [Shift] + [Enter]. • Turn Off/On Sound Playback: Enables or disables the sound while playing back the scene. • Turn Off/On Sound Scrubbing: Enables or disables the sound scrubbing effect while changing frames in the Timeline view. The sound scrubbing option is mainly used to do lip-sync decoding. • Quick Preview: Exports a Flash SWF movie of your current scene ignoring the other scenes in the project. You can press [Enter].